Carhillion of the Fold is a famed sorcerer from Melfia. He spent much time honing his sorceries and trying to “perfect his art” in one of Melfia’s renowned academies. While at the Academy he taught other students in the arts of sorcery. He believes there are no shortcuts to mastery, and was likely one of the scholars frustrated at Pyromancer Glocken and his Quartz Ring replicas. Carhillion argued that the academies were terrible places to learn magic, which angered at least Pyromancer Glocken. Carhillion believed that the scholars and teachers there were not interested in “truth”. Rosabeth explains how he once spoke excitedly about Drangleic, believing it held remnants of great power, and that a deep abyss surrounded it. 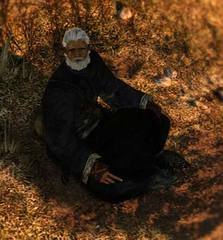 Carhillion himself elaborates on this further; the remnants he referred to are the forces of magic and souls that lie dormant in this land, perhaps meaning the spells that were developed in Drangleic and the unique souls that can be used to develop new spells. What Carhillion seems most interested in is reaching the “limits” of sorcery. He speaks of crafting new spells, and the origins of sorcery. He says that sorcery is yet a mystery to him and that he wishes to mature in it with his pupils. What seems to fascinate him is a “dark power” that he senses in Drangleic, something akin to sorcery, only more primordial. It is clear that he is referring to hexes and the Dark. It may be that hexes are the “truth” that he is searching for, as they are spawned from the Dark Soul, humanity's common calling card. Left to his own devises it seems that Carhillion would become fascinated with the Dark and take a similar path to Felkin the Hexer. However, we see no evidence of this in game, as Carhillion does not change from the moment we meet him. While travelling to Drangleic he encountered Rosabeth of Melfia who was a student at his academy. They spoke once or twice, but never traveled together. When she disappeared he wondered what happened to her, but was too interested in his study of Drangleic to search. It is likely that Rosabeth does not have a high enough intelligence for Carhillion to take her on as a pupil as even when they are reunited she says that she has decided to "keep at it alone". Carhillion’s membership in the “Fold” is interesting to note. It may have been the title that was given to him while he was a teacher at the Academy, which is where he was most famed. That would explain why he uses it to identify himself to the Player. The Fold is likely the administration at the Academy whose shared aim was teaching students sorcery and pyromancy, but since leaving the Academy, it seems strange that he continues to use the title as his aims and values no longer align. TL:DR - Carhillion is a famed sorcerer from Melfia. He spent much time honing his sorceries in one of Melfia's renowned academies, but he argued that academies were terrible places to learn magic and set out for Drangleic, a land in which the forces of magic and souls lie dormant. I am Carhillion, and I've no interest in the magic-impaired." Very well. From this day, you shall be my new pupil. I am Carhillion. Carhillion of the Fold. Surely you've heard the name? Now, now, do not be afraid. Let us explore the limits of sorcery." "Do you seek my teachings? Very well, very well." "Back already? Your diligence is commendable." "Your visit is welcome. I trust you've kept up your studies." "Oh, there you are. Do you seek my teachings?" "Young pupil, do not take my teachings lightly." "One day, my teachings will save you." "The path is yet long, young pupil." "The forces of magic, and souls, lie dormant in this land. It is a fitting place to hone my sorceries. I suspect that I may even conjure up new spells here. Sorcery is yet a mystery, even to me. Let us mature together, young pupil." "Use scrolls to unleash the power of sorceries. But the power of each scroll is reliant on that of its owner. The untrained cannot wield a scroll to its proper potential. Never forget, young pupil… There are no shortcuts to mastery." "Young pupil, may we meet again, in Majula." "Oh, so you've finally decided to join us? Let us resume our exploration of sorcery." "Sorcery and pyromancy thrive in Melfia. I've spent much time there, trying to perfect my art. But staying was a mistake. The fools there had no interest in truth. Their ambitions were paltry, and their smiles cloying. I was sick to the back teeth of their petty squabbles. There was nothing for me in that forsaken land." "On my trip here, I met a strange girl once or twice. After a time, I never saw her again. I wonder where she went off to. We spoke only a few times, but… A fair lass, if a bit clumsy. I hope that she is safe." "I sense a dark power here. I wish to find out more about it, but as we see, this place is in ruins. "Sorcery was created long, long ago. But we've no way of knowing if such claims are true. Many sorceries were lost over the ages. Before pyromancy, there were fire sorceries, but they are long forgotten." "So, the girl's been here too. I'm glad to see her safe, whatever that's worth." "Ah, here, a fitting gift for you. Seek higher planes, young pupil." "Have you lost your head?" "The arrogance of the young!" "Thank you so much! I'm very happy for this gift. After I change into this, I'm heading for Majula. I'm not sure where I might find Milord. But perhaps Majula is my best chance." "I have my very own teacher. His name is Carhillion of the Fold, a famed sorcerer in Melfia, our home town. I was fascinated by sorcery! And so…! Well, he's so unique, you see… When he set out for Drangleic, I couldn't let him go alone. But we were separated…quite early on, I'm afraid…"
"I'm rather unskilled…Milord probably ditched me. But oddly, I'm a fast learner when it comes to pyromancy. What we're fascinated by, and we're skilled at, are not always the same thing. Why can't I just focus on what I truly enjoy? Ooh, dear, I shouldn't be so choosy! It's hardly my place…"
"I finally tracked down my teacher. But I've decided to keep at it alone. I need to see what I can achieve by myself." 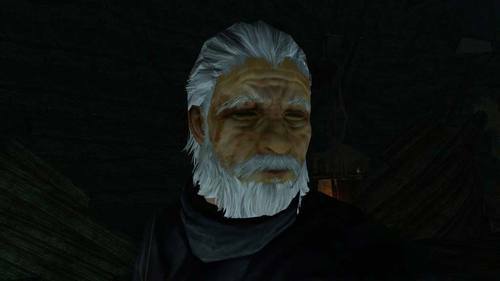 "Master Carhillion and I are from Melfia, to the south. A land lush with sorcery and pyromancy. Master Carhillion polished his art at one of our renowned magic academies. But he argued that the academies were terrible places to learn magic… This quite angered Master Glocken, my previous teacher…"
"Once, Master Carhillion spoke excitedly of this land. He made talk of the remnants…of some great power, and the deep abyss that surrounds it. I tried to ask more… But he didn't seem to hear. …I'll never be good enough, will I…"